I literally have nothing bad to say about this product. Sonia Roselli is a makeup artist based out of Chicago, and she started a skin care line because she had need for products that just weren't fulfilled with what others brands were offering, so she created them. Water Balm is supposed to be the ultimate hydrating skin prep, and I am hooked. The packaging is pearlessent, which gives it that boost of sophistication. It's clean, elegant and high end. It is SO hydrating. It really does feel like you've splashed water on your skin, it has a clean hydration that isn't gunny, lotion-like or heavy. It doesn't make you look shiny or greasy and has a lasting hydration. Plus it seals in other oils or treatments you have on underneath it. It also works well as a primer, and really helps to blend out pores and fine lines. A little goes a super long way. I usually touch my finger to the top of it and that covers my whole face. This product is a no brainer for me. It has been in my professional kit for a long time now. 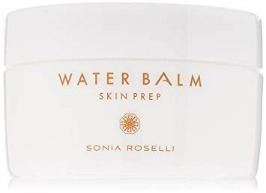 You can check out Water Balm from Sonia Roselli here.